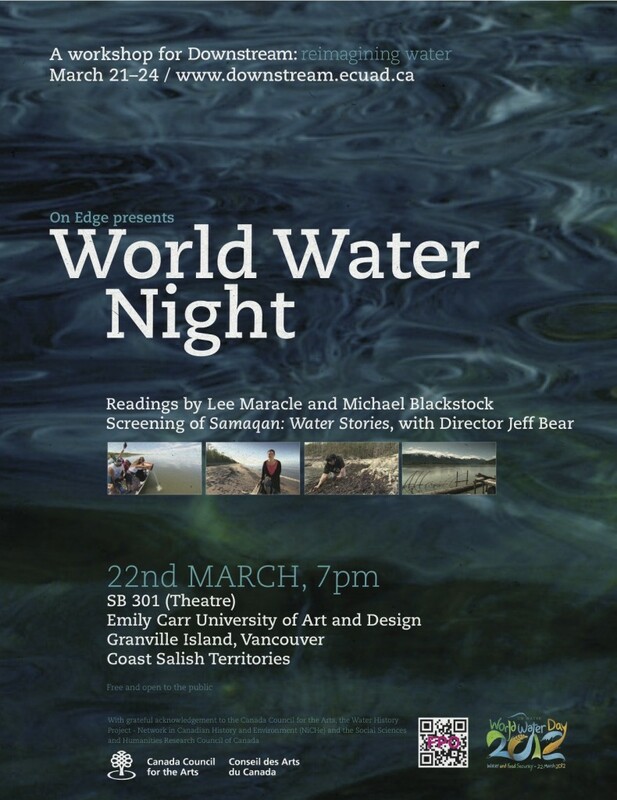 March 22, 7 pm in Emily Carr University’s lecture theater, Lee Maracle and Michael Blackstock presented readings, follwed by a screening of Samaqan: Water Stories, with Director Jeff Bear. Jeff Bear (Maliseet) produces, writes and directs independent documentaries with director Marianne Jones (Haida) at Urban Rez Productions in Vancouver. Since 2000 Urban Rez has produced the 26-part series Ravens and Eagles, for broadcast on the Aboriginal Peoples Television Network, as well as Storytellers in Motion, a 39 part documentary series about indigenous storytellers, and currently, Samaqan: Water Stories. The first documentary that Bear and Jones shot together, Burnt Church: Obstruction of Justice won the 2001 Telefilm/APTN award for Best English Language Production. Bear has worked in video and television steadily for the last 24 years. He received the 2000 Leo Award for Best Information Series as the producer of First Story, an aboriginal current affairs program broadcast in Canada on CTV. A past editor-in-chief of Kahtou magazine, he has written widely about indigenous political and cultural representation in Canada. Bear speaks the Maliseet language fluently and was raised in Tobique First Nation, New Brunswick.